The 1st Roseto International Chess Festival has just ended, and we settle down at the bar for a coffee with Oleg Mikhailovich Romanishin, it’s time for that interview that was promised to us. Romanishin speaks fluent English, as became evident during the magnificent coaching session held on Wednesday night. Luckily, the Scacchierando team is in full force, with LightKnight and Stefano Bellicampi who are far more proficient than me. See the interview with GM Evgeny Sveshnikov, also performed in Roseto. For about twenty minutes of the interview the young Lorenzo Pescatore sits with us and listens, all along handling an icecream – a very special young man our Lorenzo, not only chess-wise! The conversation is very pleasant and cordial, we don’t start with a question, but just talk about the state of Italian chess in general. Oleg Romanishin: Chess is definitely growing in Italy, as shown by the many tournaments held here. 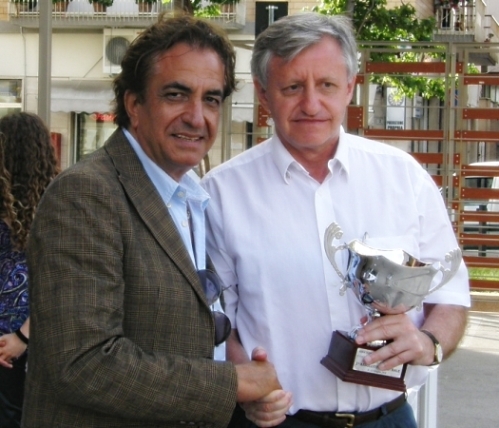 I have met many Italian players, I played against Mariotti in Leningrad, in 1977, a very creative player, many times with Godena, who is an interesting player, very solid, and with many more. I also had the opportunity of holding a brief training session with Vocaturo and Piscopo, which was organised by Nicola Pienabarca. Scacchierando: What is your impression of Fabiano Caruana? Oleg Romanishin: Caruana is clearly a talented young player, but I couldn’t say more without knowing him personally and playing and analysing with him. Scacchierando: Here you played against Axel Rombaldoni. Oleg Romanishin: Yes, I’d played him in Bratto before. I won both times, but he’s a quality player, with good potential. Maybe, at the moment, he tends to overpress. I played twice against his brother Denis as well. Scacchierando: When was your first time in Italy? 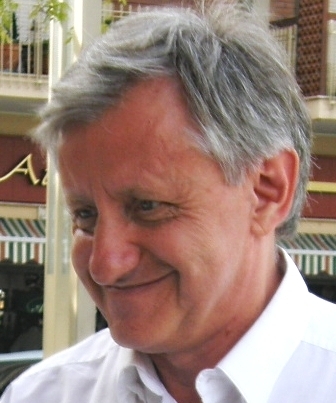 Oleg Romanishin: In 1978 I came to Genoa, for a Festa dell’Unità, holding various simultaneous events. I came back in 1984, where I played other simultaneous matches in different cities. My first tournament was Reggio Emilia 1984/85. I have since come back to Italy many times and I’ve always enjoyed it, I like Italian food a lot, and I love the coffee. During the Frascati tournament in 2006 I had the chance to walk around Rome with my family, and have a coffee in Piazza di Spagna, I have very fond memories of that day. Before I leave (to a tournament in Heviz, Hungary, on lake Balaton) I want to spend a day walking around Rome again, I like that town very much. Oleg Romanishin: Yes, with my father, who was a strong player, he was able to win the Lvov championship, our hometown. My father had a lot of books at home, and there was a nice “chess” atmosphere. I was the youngest in my family, my brothers also played but were less dedicated. Oleg Romanishin: Yes, definitely, it was the sport with the most following after football! The government actively promoted the game, which was really very popular. Chess was talked about on mainstream media, not only on specialized publications, and there were radio shows. During the 1963 Botvinnik – Petrosjan match ( Romanishin was 11 at the time), there was a news bulletin every hour, and the moves played were given. My father and I used to follow these games with a chessboard, analyzing while waiting for the next moves. Oleg Romanishin: Not really, back then, he was a good Candidate Master (a Russian CM of the time was usually modern-day FM strength), in some way he developed as a player with us, his first group of students, which was myself, Alexander Beliavsky and Adrian Mikhalcisin. 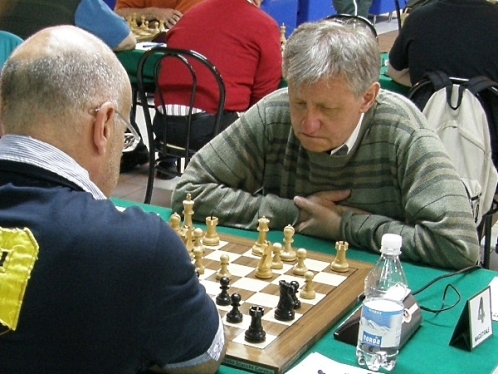 Stein’s successes, who was a good friend of Kart’s, boosted the chess scene in Lviv. In 1973 I won the Youth European championship, while Beliavsky won the World Championship. Viktor dedicated himself to us with passion and competence. Oleg Romanishin: No, that’s not correct. I was sent to play a tournament with Tal. Then, in 1975, we played together again and became good friends. We had three training sessions together. In 1977 we were joint-winners of the Leningrad tournament, ahead of Karpov, Smyslov, Vaganjan, Taimanov, Ribli, Balashov, Beliavsky … I have been very lucky, having had the opportunity of playing and working with great champions. Oleg Romanishin: It was easier once, to try theoretical novelties, if you were willing to work at the chessboard. Today, you play a novelty and after afew hours it is known all over the world. I have always played for the win, without much consideration to tournament tactics. When I have played with caution I have not always fared well. In 1975 I played a tournament in Olot, Spain. At one point I was leading with Csom and Filip, on 7.5. The following round I was paired with white against Csom, who used to play a kind of “hedgehog” formation. Before the game I came up with a novelty in the sequence 1. Nf3 Nf6 2. c4 e6 3. Nc3 b6 4. e4 Bb7, playing Bd3 on my fifth move (the move had already been tried by Huebner against Johannessen in Oslo the previous year, but databases weren’t around at the time, and Romanishin didn’t know that game). However, I didn’t want to take risks, I played a different move and lost badly. I was very unhappy about this, and I spent the whole night analysing the game and my new variation. At the end of the same year, in the Soviet Championship played in Yerevan, I played against Petrosian and this time went ahead with Bd3, winning a nice game! There is a little curiosity – in 1996, 21 years later, during the Yerevan Chess Olympiad, I went to a chemist and the man behind the counter exclaimed: “I know you! You destroyed our great Petrosjan in the 1975 championship!”. I found myself in a similar situation in the penultimate round of the Groningen tournament, in 1993, in a game where I had the black pieces against Beliavsky, which was decisive for qualification in the candidates tournament of the PCA. Two hours before the game I came up with a novelty in the Capablanca variation in the Nimzo-Indian, Qf5. (1.d4 Nf6 2. c4 e6 3. Nc3 Bb4 4. Qc2 d5 5. cxd5 Qxd5 6. Nf3 Qf5) This time, as opposed to what happened with Bd3, I played it and won! In the last round I played against Benjamin, I didn’t calculate, I played for a win and everything went well and I finished on 7 out of 11. Oleg Romanishin: In 1978, in Buenos Aires, I was selected since Karpov was playing his match with Korchnoi. I have been close to being selected on other occasions, but that was my only chance at the Olympics with the USSR , while in the European Championships I won 6 gold medals. With the Ukraine I have won two silver medals and two bronze. I don’t think much of the current team-point system. I am especially against FIDE’s “zero tolerance” rule, which I consider to be absolutely idiotic, particularly in a tournament like the Olympiad, with thousands of people in the playing hall. All you need is a little inconvenience to be late. It is a nonsensical rule for chess. In tennis, and tennis has great TV obligations, you are allowed up to a quarter of an hour! And in tennis, and in many other sports, the warm-up is held on the pitch, while in chess that isn’t the case. At Wijk aan Zee you have to pay a penalty if you are late, the highest being in the A tournament. I think it’s a good compromise. Here the interview, which lasted over two hours, comes to an end, but not our afternoon with Oleg! We offer to give him a lift to the prize-giving, which will be held in the town’s main square. While waiting for the ceremony to begin, we adjourn to a chessboard in the analysis room where Stefano asks Romanishin’s opinion about a few side-variations in the Nimzo-Indian. The result is a move order inversion which will of course remain secret! We go to the prize-giving and we then walk Romanishin to buy his bus ticket, and checking with the hotel that he could get a lift to the station, and we are joined by IM Misa Pap.